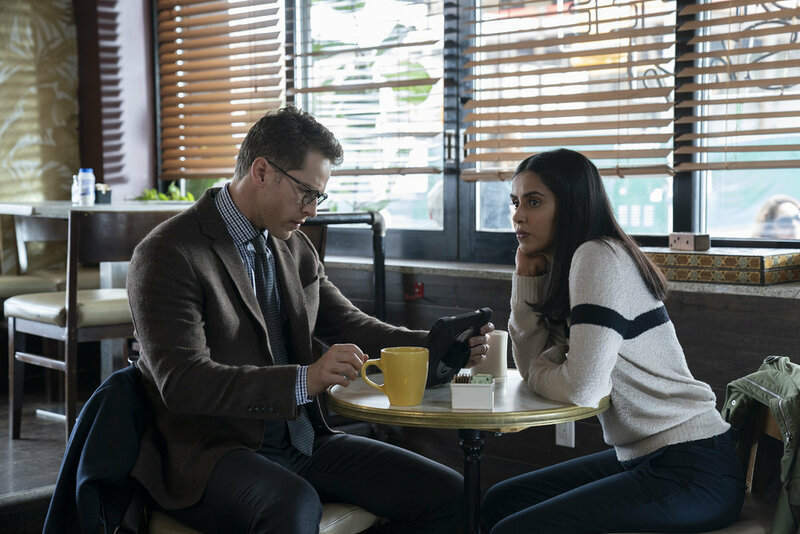 If you aren’t caught up on Manifest, you can read the last review here! The episode opens with a flashback on the plane. Kelly (Julienne Hanzelka Kim) is having difficulty getting her suitcase in the overhead compartment. Still frustrated about being bumped from her original flight, she asks, “What else could go wrong?” Dr. Fiona Clarke (Francesca Faridany) passes by and helps her with her suitcase. She has a very calm demeanor about her which completely contrasts Kelly’s stress and anger. When she speaks to Kelly, she seems to elude that they are all on that flight for a reason. Back to present day, Cal is still in the hospital with Ben pacing by his bed. When Cal wakes up, he tells his father how he still feels Marko’s presence. Looking over to Grace to assure she is still sleeping, Ben assures Cal that he will take care of this. As Cal is leaving the hospital, Saanvi tells him to relax for the whole day. Grace leaves with Cal to get him a treat and Ben stays behind with Saanvi and Michaela. Ben expresses his concern that Cal isn’t out of the woods yet, and offers a way to figure out where the facility has moved. By following the money of UDS, he may be able to track down where they are. Even though he was over qualified for the position, he was hired for a job with JP Williamson. At home, Grace is excited about Ben’s new job. (She is probably more excited to think it will take his mind off the plane.)[Ed. Note: She’s probably more excited to get him out of the house so she can have her cake and nom nom nom it all day … “cake” is code for Danny here] Olive asks to go rock climbing and Ben allows her to go. When he looks back to Grace, she tells him that Olive is going with Danny. Annoyed, Ben notes that he has to get to work on his first day and leaves. Michaela is outside the house and stresses her concern about Ben working for this company. She feels someone might pick up on him snooping, but he doesn’t think they will make the connection. In the lobby of JP Williamson, Ben meets Ronnie Wilcox (Michael Drayer), his supervisor. The first thing Ronnie (very loudly) mentions is Ben’s association to the flight. He gives Ben his badge for the building and they joke about meeting aliens. Ronnie tells him he will be involved with smaller companies to start with and that he needs to be a supervisor to handle the bigger companies. As he is leaving Ben’s cubicle, Ronnie mentions a poker game that some of the employees partake in. 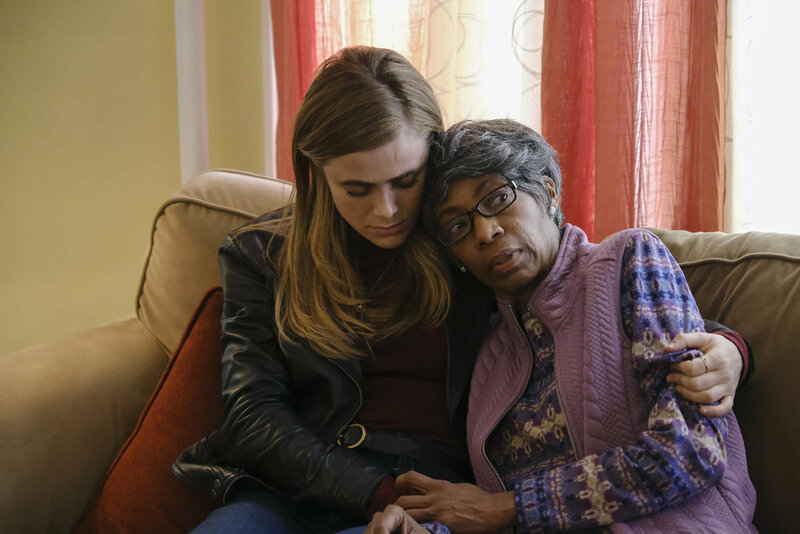 Michaela visits Evie’s mother, Beverly. Her dementia is getting worse and she asks about Evie coming home. Going through his paperwork, Ben stops to type in Unified Dynamic Systems. He is denied access to the file without the proper security clearance. Ben decides to microwave his badge to borrow his bosses with more access. When he logs into the computer, he was granted access to those files now and brought up UDS. Next to Fiona Clarke’s name was a field marked “S.P.” When Ben clicked on it, he doesn’t have access, but he is able to access Fiona Clarke. He calls Saanvi with the news. At a café, Saanvi tells Ben that Fiona Clarke started her career in neural psychology and ended up being blackballed for fringe beliefs, so she shifted to spiritual circles. 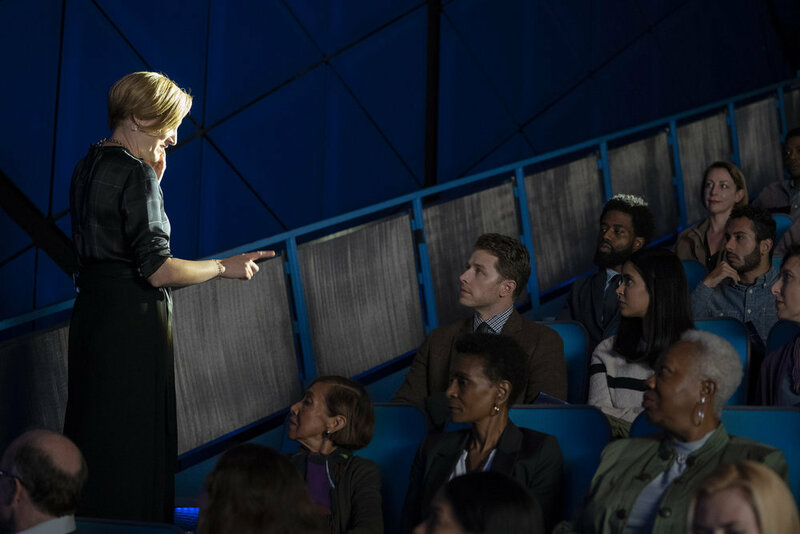 She believes that our brains could sync up to one another similar to what Cal is doing with Marko. Together, they run through several ‘what if’ scenarios: What if Fiona had the passengers abducted? What if she’s the mastermind behind what they are doing to the detainees? What if she’s responsible for what happened to the plane? Fiona is giving a lecture that night where they might be able to ask her these questions. At home, Cal is laying in bed having visions of his time at the hospital and also of the experiments performed on Marko. Olive is rock climbing with Danny. He mentions that he wishes he could see her play soccer and it throws off her concentration. She slips off and unbuckles her harness. She has had enough for the day. He wants her to talk to him, but she won’t. Diligently keeping tabs on the passengers, Vance questions why Ben is working at JP Williamson. Powell feels they should stop focusing time on Ben’s theories because all the government agencies they have checked with know nothing about the missing passengers. That concerns Vance, and he feels Ben is trying to find answers at the accounting firm. At a food truck, Jared asks Michaela if she would like to come over for dinner. She politely declines and they joke about the voices in her head blowing him off. He asks if she still hears them. Thinking that it might affect him or their job, Michaela tells him that she hasn’t heard them and she won’t mess up again. Jared isn’t concerned about himself; he is more concerned about her. He reveals that the NSA is looking into her and assures her that he won’t say anything to them. They leave to take a ‘shots fired’ call over the radio. When they arrive at the scene, Jared chases after the shooter and Michaela aides the victim. She started chest compressions, but couldn’t get a pulse even though she is hearing a heartbeat. At the station, Michaela brings the victim’s nephew, Carlos (Mateo Ferro), a cup of hot cocoa. Carlos tells her that his uncle cared for him after his mother died. They bring Carlos to a police lineup. He doesn’t feel he can do it and leaves the room. Jared thinks that Carlos froze up and hopefully he can try again tomorrow. Seeing that something is bothering Michaela, Jared asks what’s wrong. She replies, vaguely, that she feels she needs to help Carlos somehow. As she is leaving, Jared reminds her about dinner. She gives in when Jared tells her he already said yes to Lourdes. 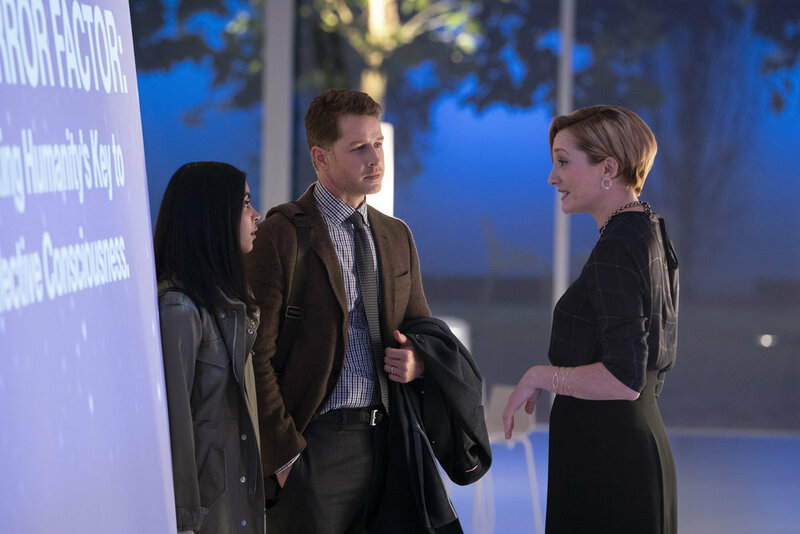 Ben and Saanvi are sitting in on the lecture from Fiona Clarke and he texts Grace that he is out at a poker game with his coworkers. He also texts Olive, but she doesn’t reply. Michaela, Jared and Lourdes are laughing at dinner when Michaela starts to hear a heartbeat again. She quickly thanks them for dinner and leaves. Thinking everything was going well, Lourdes is upset. Even though Jared knows that Michaela is getting one of her premonitions, he offers the excuse that she probably wasn’t ready for dinner. Michaela goes to visit Carlos. The reason he doesn’t want to identify the killer is so he can kill the man himself. Michaela tries to get through to him and tell him that dark path is not one he wants to travel down. At the lecture, Ben and Saanvi are listening to Dr. Fiona Clarke talk about having people feel empathy for everyone. She talks about collective conscientiousness and the mirror factor working together. 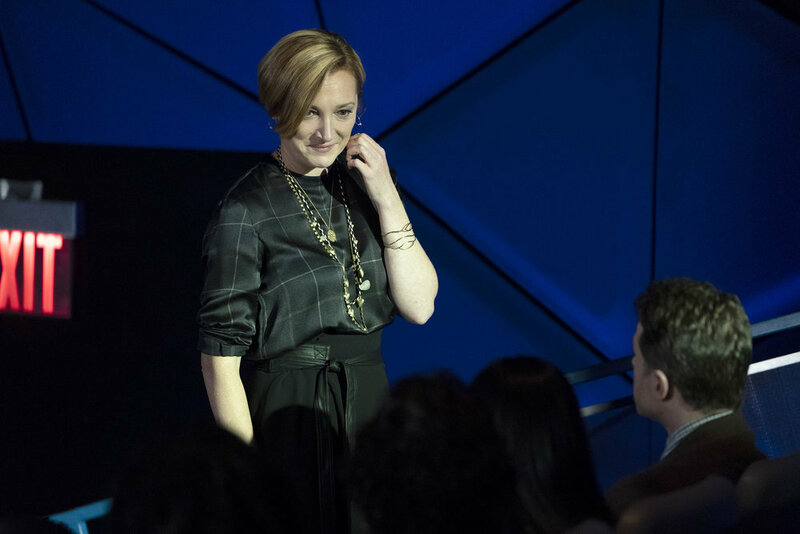 As she passes Ben in the audience, she pauses, recognizing him. After the lecture, Ben and Saanvi waited for Fiona. 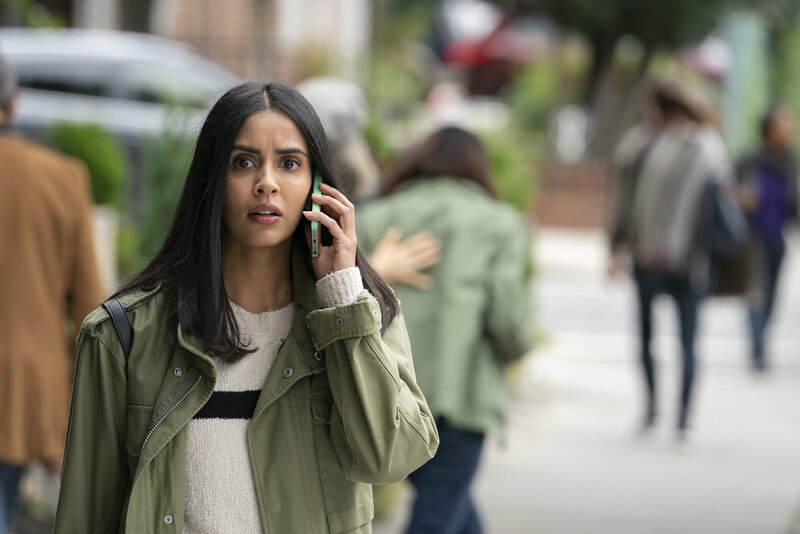 Saanvi asks why she would be waiting for them, and Fiona feels that it’s natural for survivors to seek each other out. Ben and Saanvi begin to interrogate her about the callings they are having and the passengers going missing. Fiona seems surprised by the questions, denying that she knew any of it. She tells them that she was approached by a non-profit organization, The Singularity Project (SP) interested in funding her mind/body research. Ben decides that the way into learning more about SP is going to poker night with his coworkers. One of the guys there works in IT and Ben hits it off with him quickly. At home the next day, Olive is sitting in the kitchen. Ben joins her and asks how rock climbing went. She tells him that she quit and Ben chimes in with fatherly advice of how glad he was that it helped her get through everything. Cal comes into the kitchen and tells his father that he feels Marko even more now. Ben tells him that they are getting closer to finding Marko. Jared checks in with Michaela at work to see if she is okay. She tells him that she thinks Carlos is planning a revenge kill and she went to go talk to him. He is livid that Carlos could now get rid of the gun and blames the voices getting in the way of things. Just then, Carlos walks in, hands over the gun and is ready to identify the man. One of the officers tells them that they had let him go, since they had nothing on him. Olive goes back to rock climbing to find Danny. She reveals that she never wanted to go rock climbing, just spend time with him, but she is not a quitter and she will see it through. Ben visits his new friend in IT with two cups of coffee and “accidentally” spills one on the guy. The guy leaves to clean up and Ben goes into his computer. He accesses The Singularity Project and begins to copy files. He texts Saanvi the news and the NSA is watching his texts. Powell asks if he wants to send a team, but Vance says no. As Ben is leaving work, there is a security check at the door. He waits in line and drops the flash drive in his empty water bottle. His supervisor jumps in line with him and explains that it’s a random check the company does every once in awhile. As they are waiting, Ben gets a text from a random number that tells him to go left. When he does, he finds Vance who reminds him that corporate espionage is a felony. Ben reluctantly hands over the drive and asks Vance to find the passengers, but Vance just walks away. The killer is back out on the streets and about to attack another man. As Michaela and Jared are patrolling, trying to find the guy, she starts to feel the heartbeat and gives Jared directions as he is driving. He goes along with it and they find the killer just as the man attacks his target. Danny brings Olive home and Grace meets them at the front door. Ben pulls into the driveway as Danny is saying goodbye. Danny tells him that he won’t get in the way and Ben just brushes him off and goes inside the house. 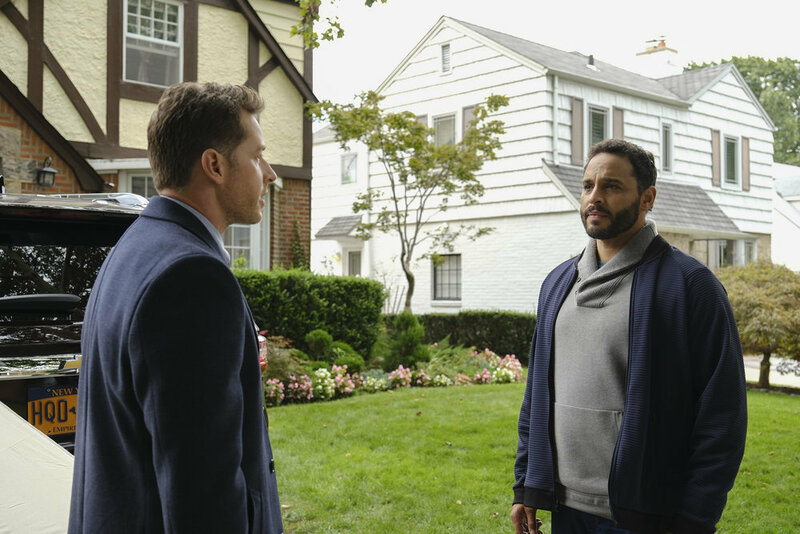 Michaela visits Carlos to tell him that they got the guy and he can now go to identify him. While she is at the shop, she hears the heartbeat again. She starts to look around. She sees a picture of Evie hanging on one of the mirrors. She asks Carlos how he knows Evie and he tells her that he had congestive heart failure and that Evie was the donor. Montage starts where Olive is looking forward to climbing Acadia, Danny is eating alone and Michaela visits Evie’s mother. Ben visits Cal and tells him that he’s making progress but a “bad guy” got in the way. Cal tells him not to worry; he isn’t a bad guy anymore. Powell calls Vance and tells him that he has a team on standby ready to take down Stone, but Vance tells him that he didn’t get anything off of Ben as he is holding the flash drive in his hand. Michaela asks Ben how Cal is doing. Ben tells her how he wants to understand more about the callings. Michaela tells him that she doesn’t understand them, but she just follows them and she feels better. She is starting to feel that everything is connected. As Ben is opening the refrigerator Michaela notices a picture Cal drew of Carlos with Evie’s heart. I enjoyed the cuts in the beginning of the episode when Ben is telling Saanvi and Michaela about the job. Splicing the job interview into the scene, moved it along and kept the story interesting. When he arrived at the job, on his first day, his supervisor mentions a poker game. I know we’re time constrained here, but I really don’t think that his supervisor would be that comfortable with him to invite him to the game. I understand that Ronnie somewhat looks to Ben as a “superstar” that met aliens, but I would still wait to mention the poker game. One thing that felt strange this episode was when Michaela was with Carlos at the police station. She brought him hot chocolate and was joking with him. He just lost his uncle and she is joking with him? That didn’t work for me. 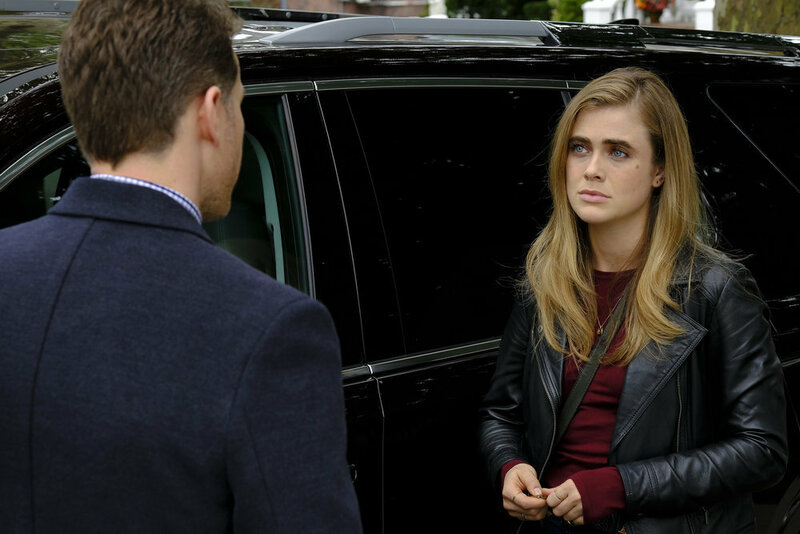 I will give Melissa Roxburgh (or her stunt double) much credit when she tackled the killer at the end of the episode. It appears as though Arizona has the worst defense in the NFL, perhaps she could help them. We learned a little more about Fiona Clarke. (Finally!) Do we believe that she knows nothing about the non-profit? Another question that came out of this episode is whether or not Vance is still a “bad guy.” He did lie to his colleague. Is he really left in the dark about all that is happening? Can we trust him? Episode score: I give this episode 4 out of 5 Casey’s. The story is finally starting to get interesting for me. Let’s stay on that track! Author CaseyPosted on January 24, 2019 Categories TV RecapsTags Manifest, NBC, S.N.A.F.U.